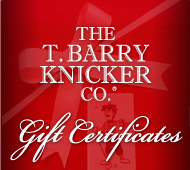 The T. Barry Knicker Co.
$25, $50, $100, $250, $500 and more! Email them to your golf buddies, friends, and family! Give the Gift of Quality and High Style!